In our series of blog posts on coaching tools, we have arrived at the real crowd-pleaser: serving champagne in the Daily Standup. For a long time, the coaches at agile42 have experimented with champagne in other settings, and we believe that time has come for the noble drink to finally take center stage in Scrum! To satisfy our thirst for information regarding the pros and cons of enjoying a glass or two at the daily, we turn to Ima Drunkarde (PhD, VSOP), the well-known alcohol researcher from the University of Applied Chemistry in Wien. "Well," says Ima, "we are happy, yes one could even say intoxicated by this opportunity to connect the somewhat dry academic world of applied chemistry research with the fizzling and sparkling real-life industry setting!" That settled, we gently guide the interview towards the upsides and downsides of enjoying champagne in the daily standups. This seems to be a novel approach with a lot of potential benefits — what would be the most visible impact? "The most clear advantage is that people start arriving on time," explains Dr. Drunkarde. "Without champagne, the standups generally started up to ten minutes late. With champagne, the test subjects were able to cut that down by an order of magnitude!" "Surprisingly, this effect is partially due to the open offices that are so popular nowadays. In an open office, the distinctive pop of a champagne cork carries quite far, and people immediately make a beeline for the kitchen," says Dr. Drunkarde, taking a sip from a research bottle. "Congested pathways and thoroughfares can be easily identified and avoided in the open landscape, speeding up the arrival of key stakeholders." "Of course, actually serving the champagne into glasses can take several minutes. However, if you put serving champagne on the agenda as the very first point, you can actually start the meeting even before everyone has arrived," hints Dr. Drunkarde. It transpires that the research group has experimented not only with the agenda, but also with some traditional standup tools. "The champagne bottle in fact makes a convenient talking stick," Dr. Drunkarde explains. "Or you can spin it on the table, so that the person it points to goes next. A very adaptable thing, the champagne bottle!" So, what other benefits are there in drinking champagne in the daily? "Well, firstly, we were also able to verify the old saying in vino veritas! People are a lot more forthright, but perhaps their prononsh… pronouncsh… pronouncshiasch… um, schpee... speesch… uh, their talking, it becomes a bit unclear." Dr. Drunkarde pauses, collects his thoughts and proceeds to rattle off a handful of other benefits as he ticks them off on his fingers, only missing once or twice. "Second, the relaxing effect from the first glass actually makes people more alert and accurate. Third, the standup becomes more fun. Fourth, it pulls in stakeholders… lots of stakeholders, in fact many people you didn’t even know were stakeholders! Isn’t that great? Fifth, people find it easier to talk French, German and other languages they haven't used since school. Sixth, your colleagues become more attractive, which in the software business is not to be underestimated," he concludes the list. "I could go on, but I’m getting a bit dry in the throat," Dr. Drunkarde says and drains his glass, only to refill it from a handy unlabeled bottle. "Ahh…! An excellent double-blind, late 1990…? or possibly 1996…"
Hrm. 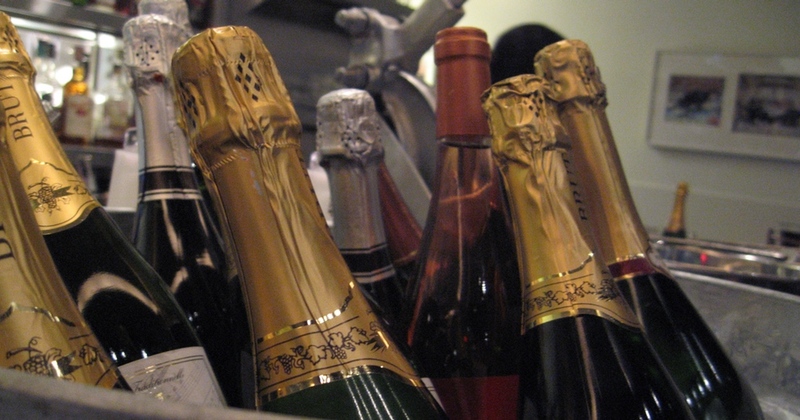 How about other drinks, for example cremant, cava, prosecco or perhaps sekt? The eyes of Dr. Drunkarde bulge, and we are afraid that he will choke on his drink. "No no," he exclaims after a minute, "we did an in-depth comparative analysis with several other drinks. Very in-depth, in fact. And plain sparkling wine simply does not compare with the real stuff. In the beginning people pop in as fast as they can, but you can see how disappointed they get." "Beer... well, people just start nipping off to the restroom. Chilled vodka does have some effect of course, and you can always use it to clean electronics. And the stronger drinks... yes, we reconstructed the Gagrakackan tzjin-anthony-ks by chemically analyzing the stains on a towel. However, local farmers called in to complain when we started serving it." Dr. Drunkarde again takes a deep sip from his glass before continuing. "The pan galactic gargle blaster turned out to take very long to prepare — it has to be served fresh — and then nobody was able to write any code for several weeks. The rehabilitation costs alone almost drove the company bankrupt. But it did do wonders for the old team spirit!" We believe the doctor. How about downsides, then? "Yes, unfortunately multi-site teams tend to suffer. There is something about enjoying champagne that does not transfer well over a teleconference. Another problem is that the meetings tend to drag out. One standup lasted almost twenty hours, people just refused to leave until the champagne stopped flowing, and by then it was too late. The last man standing was apparently still trying to update the sprint board at four thirty in the morning!" Any final thoughts on the matter? "Luckily the Daily Standup rules only ban coffee, not champagne," Dr. Drunkarde says happily over another sip. "Abominable drink, coffee. Can’t stand it."